The Alahambre Art Nouveau style Tiffany lighting collection, a stunning range featuring a dome shaped shade and linear design, with flowing curves based on natural forms, handmade using high quality art glass. Brought to you by Elstead Lighting and designed by Quoizel. 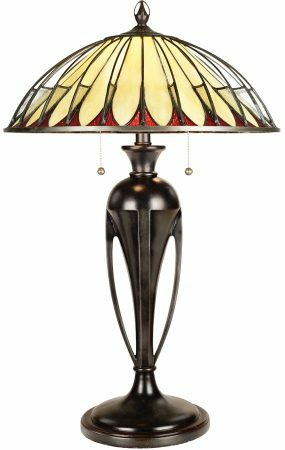 A wonderful two light contemporary Art Nouveau style Tiffany table lamp, with a circular cast resin base and open urn body finished in vintage bronze. The wonderful Tiffany shade contains 96 separate pieces of high quality art glass and features gently curved panels radiating from the centre to the rim. The main central panels are in shades of cream coloured opalescent glass, highlighted with peaks of rippled wine around the edge. The shade top is decorated with brass wires running from the centre to the rim, inset with granite textured glass panels that form webs on the outer edge that add an extra dimension. Two separate pull cord chains hang below the shade for convenience, flexibility and style. This is a very detailed multi dimensional design that uses all of its elements to create something rather special. Part of the hand crafted Alahambre Tiffany lighting selection designed by Quoizel.